All Millennium Systems International Skid Systems feature a rugged perimeter box frame construction with structural steel crossmembers for component support and optional containment drip pan. All welded construction and hydrostatically-tested piping runs assure you of premium quality and unmatched performance for years to come. 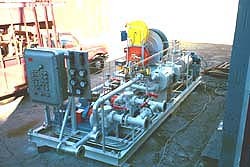 All Skid Systems are available with custom-engineered Control Panels and instrumentation.